I have taken 3 calls this week from concerning customers about their Lawns in North Attleboro. The calls were similiar in the fact that they all were seeing the lawn mowers were causing tracking in the lawn. 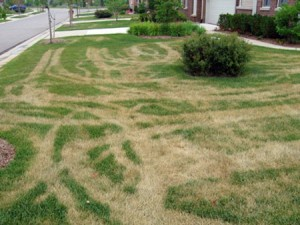 This is often mistaken as a chemical burn by your lawn care company. Cool season grasses (like we have in New England) prefer cool temperatures. When the soil temperatures spike like they have in the last two weeks the lawns shut down (if we are not keeping the soil cool with regular watering) and become dormant. Extended dormancy or drought could damage the turf, but most lawns will recover when the rain and cooler temperatures return.